This recipe has been changed so many times, yet the first time I made it was absolutely the best. There really is no secret to this, although not many people have been able to duplicate it. This recipe is something I make often and honestly I am adamant about every single ingredient. It’s so simple and quick and the specific brands such as Frank’s Red Hot Sauce are very important. Also, you should make your own Blue Cheese. Sometimes I get lazy and instead of making it completely homemade I will buy Blue Cheese chunks and add them to a bottle of Blue Cheese and then add a little white vinegar and a little bit of mayonnaise. It always turns out fantastic and it’s perfect for this pizza. Also, I know it seems like a lot of sauce, but you won’t regret it. I like everything extra juicy and saucy whether it’s a lot of mayo on my sandwich or a lot of ketchup with my fries or a lot of thousand island on my Reuben. Regardless, I like my food nice and messy! The next thing is when making crust for a pizza I am 100% all about using a fresh dough ball. Believe me, it makes a HUGE difference. So don’t use any different hot sauce and don’t use store bought dough in a can or pre-made pizza shells. 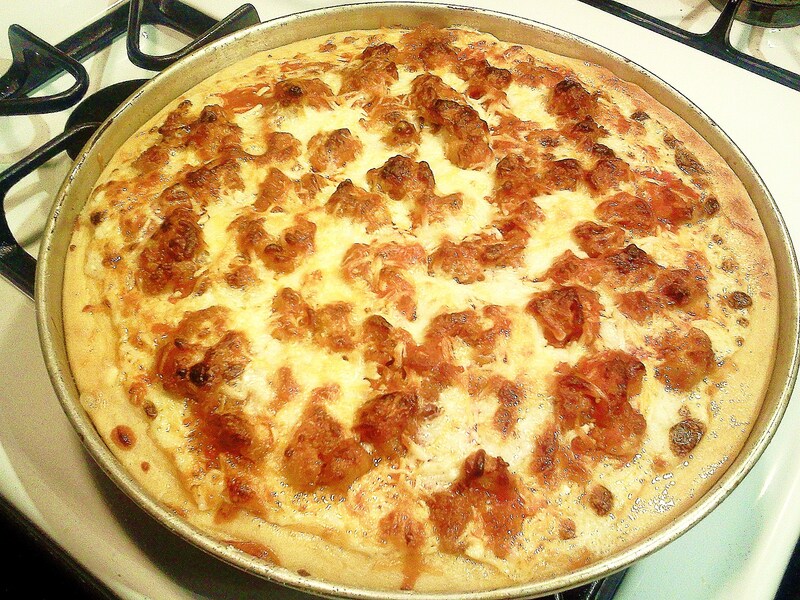 One more thing before I give up my infamous Buffalo Chicken pizza recipe, I like to use fried chicken on my pizza, but sometimes I am too lazy to fry my chicken or I just don’t have time to do it. Also, it makes a huge mess, and is very wasteful of oil and flour and egg. I made my Buffalo Chicken Pizza last night for dinner and wanted the best of both worlds, fried chicken without the hassle. I decided to try something that sounded really silly, but alas, it worked! I wondered if I could use extra oil in my pan while cooking my chicken and sprinkle flour onto the chicken and get a similar taste as if it were fried. It wasn’t exactly the same, but it only took a second and the chicken came out great! You will have to continue adding oil every minute or so because the flour soaks it up, but as well as being quick and not messy, I also did not end up with a pan full of oil afterwards that I didn’t know what to do with! So basically you are going to cut the raw chicken into small pieces, put them in a pan with oil and cook almost all the way, add more oil and sprinkle flour on the chicken. Continue stirring little by little and adding flour until the chicken is coated and starts to brown up. You can add as much or little as possible but make sure there is always oil in the pan. Then, I just let the chicken sit and cook and brown up and the breading got nice and golden and crunchy. Once I was done I dumped the hot sauce right in the pan! Now in the picture it looks a little burned, I’m not sure why, but in person it was golden and delicious. This pizza is pretty messy but that’s why we have napkins! Cut raw chicken into small pieces and cook in pan with oil. Sprinkle flour over chicken while cooking, be sure to keep pan wet with oil. Use as much or as little as you want of flour and oil to get it how you like. Let chicken brown and get a little bit crispy. Pour hot sauce over chicken when done, you should not have so much oil that it needs to be drained, but if it does, transfer chicken to a bowl and add hot sauce. Press out dough ball to desired size and thickness. Use Blue Cheese as sauce and spread over dough, then add a little hot sauce over the dressing.. Sprinkle cheese over top. Sprinkle chicken over the cheese and then drizzle Blue Cheese and Hot Sauce over the top of the chicken all over pizza. 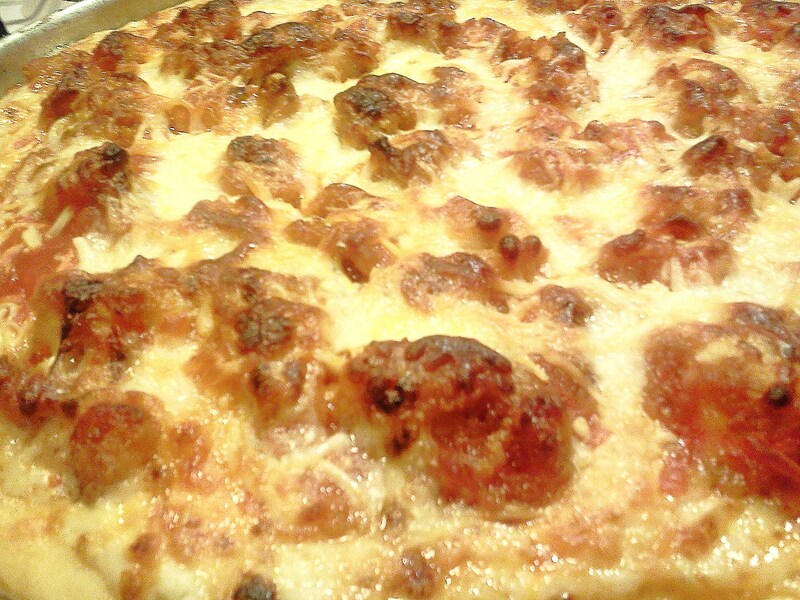 Top with a light sprinkling of cheese and place in the oven. You can cook it however you want, I prefer to use a greased pizza pan, although you can use a pizza stone or put it right on the oven rack. I probably wouldn’t recommend using the oven rack as it can get messy, although if you are using much less sauce you probably will not have a problem. I usually don’t time it, but I keep an eye on it and when the cheese is melted and the dough is nice and golden I take it out. If you like your dough a little bit crispier leave it in longer.